This tomato and asparagus salad is just a bit different. You don’t often see recipes pairing these two vegetables, but they really taste great together in this easy salad recipe. The dressing is a simple olive oil and red wine vinegar mixture with shallots and parmesan cheese for a bit of extra zing. I think you will love it. Use the form below to let me know or to send in a favorite recipe of yours to share with others. Steam the asparagus until it is bright green and tender. Rinse the asparagus under cold water, then drain it thoroughly and transfer to a serving bowl. Add the tomatoes and shallots and stir to mix. In a jar with a tight fitting lid combine the oil and vinegar. Season the vinaigrette with salt and pepper to taste. Shake it vigorously to mix well. 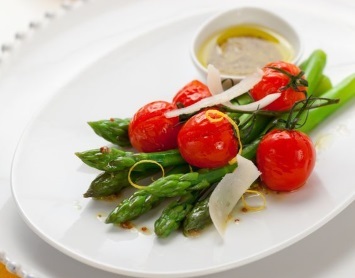 Pour the vinaigrette over asparagus and tomatoes and toss. Sprinkle shavings of parmesan cheese on top or grate parmesan cheese over the salad. You can also roast the tomatoes before adding them to the salad as shown in the image. Place them in a pan and drizzle a bit of olive oil over them. Roast them in a preheated oven at 375ºF for 5 to 10 minutes, until the skin blisters and breaks open. Add them to the asparagus and pour the vinaigrette over the whole thing. Roasted tomatoes can be eaten either warm or cold. You probably already know this, but those newer to cooking asparagus may not know that you have to trim the woody ends before eating it. To do that hold each spear of asparagus about halfway down the stem with one hand. With your other hand, snap off the stem end of the spear. It will snap easily at the point where the asparagus becomes tender. This is a very healthy diabetic recipe. It is lower in carbs, which is important in a diabetic diet and gives you the benefits of olive oil, a very healthy fat. You can use the tougher ends for asparagus soup or save them to add to the pot when you make your next vegetable stock. 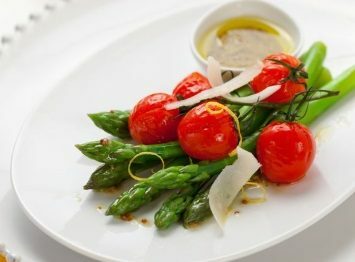 If you like this asparagus and tomato salad recipe, you may want to browse all of our salad recipes. Look here for more ideas on how to cook asparagus.